The moment a father welcomes his new baby into the world is always special. But one new dad in America was not only present for the birth of his twins, he was also the one who delivered them. This stunning photo series by award-winning photographer Robin Baker showcases one of the rarest moments in childbirth – a natural home-birth delivery of twins, one of which is born with the amniotic sac still intact. The babies are placed into the arms of their mum by the most important man in their lives – their dad. You may have stumbled upon our post on the most incredible birth photography images of 2016 where we looked at the winners of the International Birth Association Awards. One of the winners, Birth Blessings Photography & Childbirth Services, has now shared even more stunning photos of this day. Not only was one of the twins born en caul, something that only occurs in 1 in 80,000 births, but the husband was the one who delivered his twins. The photos of the couple, calm and in control as they welcome their twins, will take your breath away. 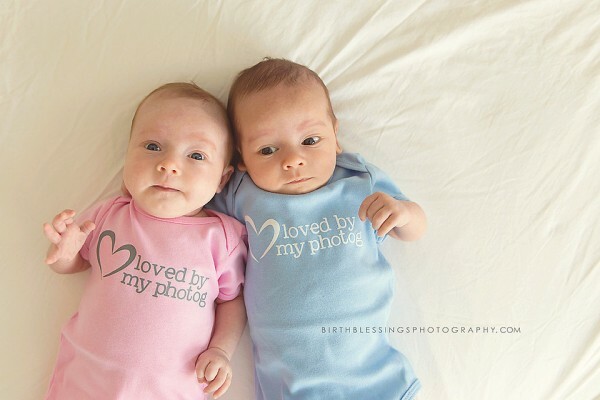 Robin Baker, of Birth Blessings Photography & Childbirth Services has witnessed more than 70 births, but none of them quite compare to the arrival of this pair of twins in California, US. When Robin was called to her client’s residence, she predicted a long labour. However, as soon as the expecting mum got into the bath, things progressed incredibly quickly. Working together, the new mum and dad, who remain unnamed, brought their children into the world while communicating to a doctor over the phone and being coached by Robin, who has assisted in births before. The twins, a boy and a girl, arrived within 30 minutes of one another with the second twin being born while still en caul. Robin recalls that the parents were calm, peaceful and effortlessly brought their babies into the world. One look at the stunning photos and you can see the beautiful bond between this foursome. Check out the full series at Birth Blessings Photography & Childbirth Services and experience the beauty that is birth photography with our featured photo series.